Vanier thoughtfully explores the topics of love and purpose while expanding on God’s greatest mysteries. Franciscan Media today announces its release of two new works from the 2015 Templeton Prize laureate, Jean Vanier, later this year. The Gospel of John, The Gospel of Relationship and Life’s Great Questions each examine the love of God and our purpose on earth as only the renowned philosopher, moral leader, and writer of more than 30 books can. 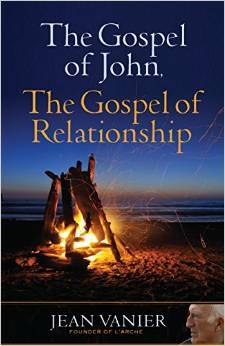 "The Gospel of John, The Gospel of Relationship," scheduled for release on April 24, examines the two great commandments: the love of God and love of others. Vanier eloquently demonstrates how the two commandments are, in fact, the same as individuals express their love for God through compassionate care for one another and encounter the love of God tangibly through closeness. In this chapter-by-chapter exploration of the Gospel of John, Vanier explains how Jesus taught this lesson throughout his ministry. The book includes personal stories from his work with L'Arche that express the great privilege we have of developing our relationships with one another and with God. 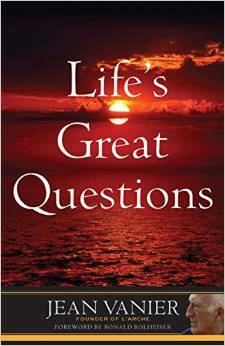 "Life’s Great Questions" explores the ponderings every great philosopher seeks to understand, such as: Who are we? Why are we here? What is the purpose of life? With Vanier’s characteristically deep yet accessible style, the philosopher and humanitarian encourages his readers to delve more deeply into their own faith and spirituality, while guiding you to find your own answers to life’s great questions. "Life’s Great Questions" is scheduled for release on August 25. Franciscan Media seeks to help Christians grow closer to God by creating inspiring and innovative products in the spirit of St. Francis, to best meet individuals where they are on their personal faith journeys. Located in Cincinnati, OH, Franciscan Media, LLC is a nonprofit that is financed and operated by the Franciscan Friars of St. John the Baptist, a province of the worldwide Order of Friars Minor. The multimedia company is comprised of St. Anthony Messenger magazine, Franciscan Media Books and Servant books and audios, Catholic Greetings, Saint of the Day, Minute Meditations, and AmericanCatholic.org, each as a resource to millions around the world. Connect with Franciscan Media on Facebook, Twitter, LinkedIn and Instagram. Jean Vanier, winner of the 2015 Templeton Prize, is a Canadian Catholic philosopher turned theologian and humanitarian, and the founder of L'Arche, an international federation dedicated to the creation and growth of homes, programs and support networks with people who have intellectual or learning disabilities. He lives in Trosly-Breuil, France, and travels widely, visiting other L'Arche communities, encouraging projects for new communities, and giving lectures and retreats.